To sledge or not to? 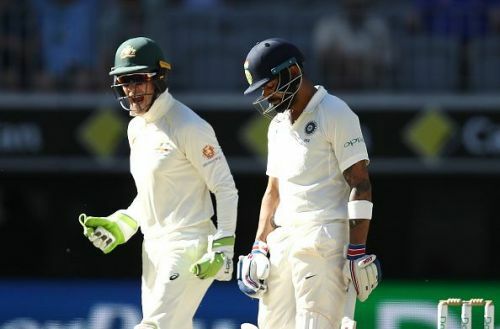 A lot has been talked about verbal volleys being exchanged in the ongoing Test series down under between India and Australia. The world is divided when it comes to putting weight for or against this practice. Many have rendered this as an act of disgrace for the gentleman’s game. However, this is not the era of 1950s nor the game is just being played between the teams as a weekend hobby. The stake is a lot high and the game has become highly competitive. Is sledging a sin? It should never be. It is not a crime. It adds flavour to the game. It adds a punch and brings out the best from a certain individual. Of course, it has to be limited to verbal attacks or animated theatrics rather than turning into a physical drama. This is a mind game. This is about throwing off an individual or a team by an act of chirp. None of those players who are into it aspire to become a stand-up comedian or a theatre actor. They do it only to deviate the course of the game of a certain individual or the opposition. Otherwise, standing on the ground for 90 overs straight up makes it a monotonous job. The energy has to be high. At the end, it results in fetching brownies for a lot of parameters – brings out the best, keeps the game alive, and keeps the audience involved. Turning back the pages, there have been incidents which have crossed the limit and has entered the line of fire. Warne plucking out Samuels’s jersey or the Pollard and Starc incident – these clips does send a shiver down the spine for any match referee. However, the Kohli and Paine chirp was healthy. Nobody was physical. This was sheer talking and nothing else. Samuels giving a grand salute to Stokes in his dismissal was just a return gift to Ben Stokes who tried to play around with Marlon Samuels while he was about to reach the 3 figure mark in the first innings of a Test match in 2015. There have been funnier incidents – Boucher testing Tatenda Taibu’s patience with his series of heart-wrenching volleys from behind the stumps is one act of humour. The folks out in the middle are there to win the game for their country or their club. They have a common mission. Tempers do flare up and it translating into an exchange of few words should not be dealt with severity. Of course, there should not be another level of transformation to a physical banter. That is ugly and should be fined. When the pages are rolled down, very few incidents are found to have broken the thermometer. Such incidents have led to stern actions. The hue and cry being created for simple and plain sledging is something that is uncalled for and should be shut down immediately. Justin Langer has aptly said, “Sledging is good, abuse is bad”. It is high time sledging is being taken as a banter. If the line can be tracked down and be adhered to, it is actually healthy for the game. A lot has been talked about behaviour and discipline after the sandpaper gate scandal. It has made the world conscious. The worst effect has been a lot of reading happening for every minute detail on the field which is very demotivating for the game.